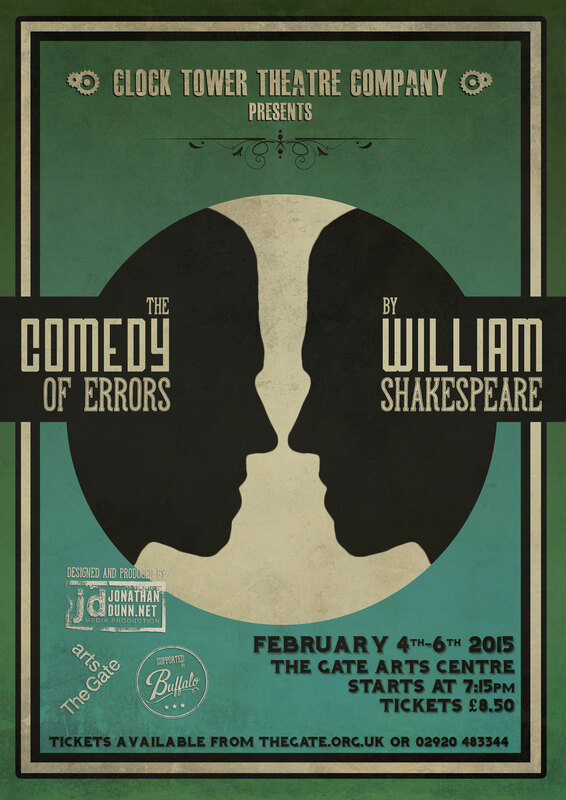 On Wednesday 4th February, I was fortunate enough to attend the opening night of ‘The Comedy of Errors’, presented by the Clock Tower Theatre Company. This Shakespearian Comedy was the fourth of the Clock Tower’s productions, after the company was founded 18 months ago by drama graduates Steve Bennett and Minty Booth. Returning to the Gate after their performance of ‘Orpheus’ in July, ‘The Comedy of Errors’ was staged in the contemporary setting of the Café Bar of the Gate Arts Centre, Roath. The play was performed by a cast of twelve talented actors, many of whom studied at one of our local universities in Cardiff. The performance began with a full house. From the outset, the production had a freshness and vibrancy that many wouldn’t associate with Shakespeare’s plays. The actors moved around the audience, making full use of the stage and the many doors in and out of the room. Meanwhile, the play was accompanied by the live band ‘Johnny Sky and the Fly Guys’, who performed on stage alongside the actors, cleverly helping to build the atmosphere and adding a modern twist to the sixteenth century play. The production even made use of the venue’s bar, with the spectating bartender’s subtle but hilarious reactions creating a clever new dimension within the play. However, the main thing that impressed me was how the production made Shakespeare accessible to the everyday audience. The actor’s enthusiasm and humour when delivering lines brought Shakespeare’s words to life: lines that are often indecipherable on paper now communicated clear meaning to the audience. The creative, modern twists, such as the live music and the venue, made the play feel real and interesting, and I think the whole audience would agree that we were drawn in from the word go. The talented actors, great music, charming venue and fantastic creativity combined to great a real gem: a hilariously fantastic performance of a classic play, made accessible to all. To find out more about the Clock Tower Company and keep an eye on what they’re up to, visit their website at http://www.clocktower-tc.co.uk or find them on facebook at www.facebook.com/ClockTowerTC. Meanwhile, find out what’s on at The Gate Arts Centre at www.thegate.org.uk/, where you can book tickets for upcoming events. The Gate also offers a variety of classes, including music and dance, which can be booked on their website.